Our new sails arrived last Wednesday and we finally left Lakki on Thursday. It was still hot, but there was a bit of wind and we were able to hoist the new sails and try them out on the short journey round to the southern tip of Leros and into the deep bay at Xerokambos. We picked up a mooring, owned by one of the enterprising taverna owners who seek encourage custom as the holding is not very good (fine sand on rock). We ended up spending three nights at Xerokambos because of gale warnings. At the same time the temperature took a tumble to around 25 degrees and the locals were joking that winter had arrived. We were glad of the cooler weather, though the strong winds take a while to get used to. We ate out at a couple of the tavernas, both were good, and even though the gusts into the bay were quite strong, we managed to sleep well after the first night. We'll definitely be going there again. 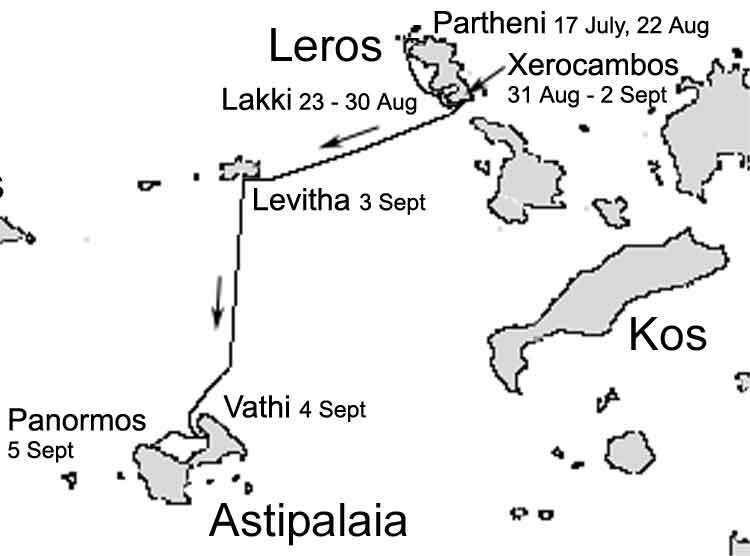 On Sunday the forecast returned to the usual F5-6 northerly winds so we set sail for the little island of Levitha, just over 20 nautical miles west of Leros. We had a brisk reach in very bumpy seas, arriving in the mid-afternoon. Levitha has only two families living on it, one of which runs the taverna and the other has laid moorings in the anchorage, making a charge for their use. The shelter is excellent so the cost of the mooring (7 Euros) was worth it. From Levitha we headed south to Astypalea, making good progress with a following wind. 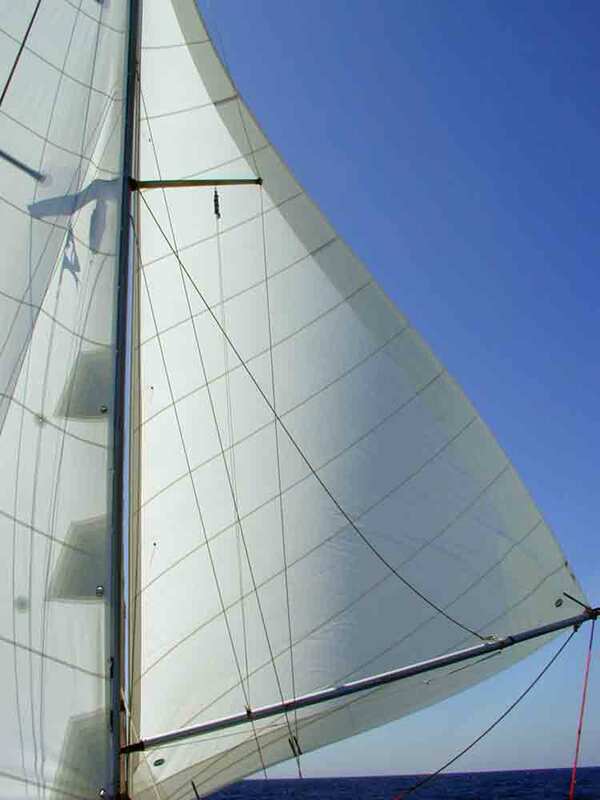 So far we've been very pleased with the performance of both the new sails and the feathering propeller. We anchored at Vathi, in a nearly landlocked bay on the NE of the island (which has two wings and a narrow isthmus in between) and spent a quiet night in good shelter, with just a few other yachts for company. New sails in action, goose-winging on run to Astypalea.